Wow it’s been a long time since I last wrote a Taneycomo report and you can blame all those Caddis that kept us heading south for the Arkansas section of the White River. Although I much prefer to fish the White River one State downstream, it’s always fun trying to solve the midge equation that always presents itself when fishing the stretch of water below Table Rock Lake. We have been subject to long stretches of generation recently following some heavy rain in the northern watershed and so it was nice to be afforded a chance to hit the stream if only for a few hours. Although the day was forecast to hot, the waters issuing from Table Rock Dam were a chilly fifty degrees and the day started with mist hanging over Taneycomo. Arriving fairly early we were presented with low water conditions, a few other fly fishers and plenty of midging trout. I’ve mentioned many times in previous reports that regular stomach content checks have revealed that the trout have a distinct preference for the midges that seem to have populated the waters of upper Taneycomo. Invariably one will see fish heavily midging when the water isn’t running although deciding on what pattern to offer is sometimes a dilemma. The initial response to seeing regular rise forms on the water is to reach for the dry fly box, although closer observation would reveal that very few of the adult midges were being taken. Looking along the surface it was easy to see the skittering adults and having chosen one to watch one, it was possible to see that they managed to cover long distances without being gobbled up by a hungry trout. What was also noticeable was the variety of rise form shapes, from dimples to complete heads breaking the surface tension. Occasionally a splashy rise would be followed by a midge adult breaking free of the surface close to the rise. I believe this phenomenon is caused by the trout targeting an emerging midge and the trout’s attack assisting the midge, or it’s close neighbor, in breaking free of the surface tension. Therefore my strong belief is that most midges are taken during that transition between pupa and adult, most commonly while held below the meniscus. So instead of the midge dry box coming out, this morning I reached for my midge pupa box. Most of the midges that I was able to capture or see leaving the surface had light cream or even white coloration so my choice of fly to begin this day was a cream biot midge pupa in a size 22. There was very little flow while the generators remained off, so instead of my regular choice of 5x tippet, I added an extra foot of 6x fluorocarbon to the 5x leader. My choice was rewarded immediately and I worked my way downstream taking fish with nice regularity although I did notice that other fly fishers weren’t having as much luck apart from one chap who declare he was using a zebra midge. So midge pupa rule! Another fun thing to do during low water situations is to work the streamside shallows and it has never ceased to amaze me how little depth of water and how close to shore some of the big fish will work. During lunch we watched fish cruising the shoreline picking up food from both surface and bottom. One particularly nice fish headed in our direction and so I quickly tied on a Tupps Indispensable which was still hanging in my drying pouch from a sulphur hatch we had fished in Arkansas. I dropped it six inches from the edge and eagerly awaited the fish’s arrival as she slowly worked her way towards my fly. When she was within a couple of feet, a slight twitch was all it took, the fish dipped its head and inhaled the fly. A few minutes later the nineteen inch rainbow was in my hand – nice! 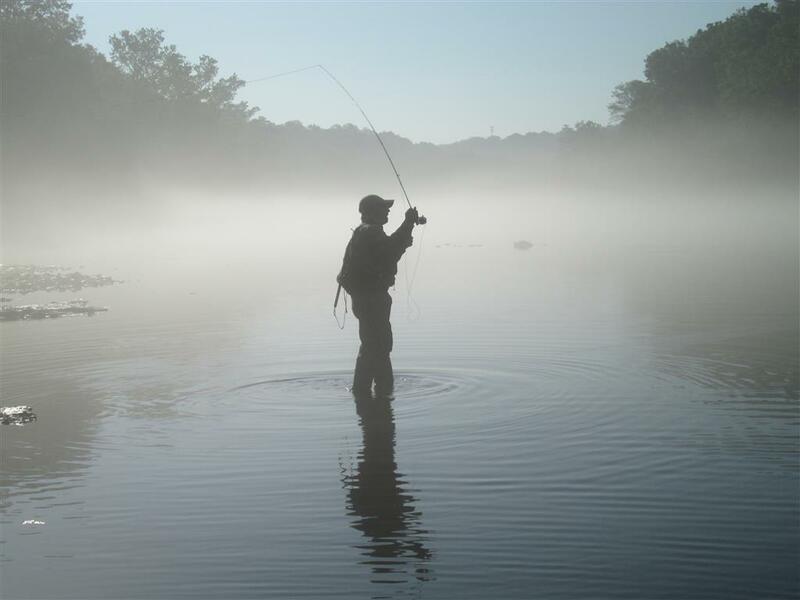 This entry was posted in Fly Fishing, Stream Report and tagged fly fishing, midges, rainbow trout, tanneycomo, white river. Bookmark the permalink.